I try to keep stuff off the fridge. I do. But one becomes attached. These are the final hold outs. The cocktail menu from my Brooklyn book launch. A birthday card from me to the Frenchman, bought in Cape Town. A kitty cookie cutter, give to me in Koringberg by a Voer blogger who lives in Toronto, fra from home; a photo of Storbie, taken by Wolfgang, upstairs and left for us at our door; and an Airstream post card, included as a small bonus with a purchase I made on Etsy. Oh... I would love an Airstream. But how the hell does one do that? Six months to a year on the road, across the US of A, eating and cooking and feeding people along the way. Learning the country. Gathering it in groups of four and six and ten or two or just one, around a fold out table covered with a red and white checked cloth. Listening to it talk at night, with moths flapping against the glass chimneys of the oil lamps. The fire still warm. Local produce eaten. Local labourers or farmers or gardeners fed. The cat staring at us through the small window, opening his mouth in a silent Eep, the Frenchman yawning and impatient to get to the previous days' photos of countryside on his computer. The stars wide at night. It is, indeed, a great way to see the country. We have a smaller camper now which is difficult to cook in- but I know airstreams can be accommodated for many needs (my Uncle rigged one for a wheel chair). If you figure out how to travel for that length of time with a kitteh, PLEASE let me know!! Jan D.
Err, Marie I think you know this, but the idea sounds like a book. Isn't that what you do -blending regional flavor with your personal narrative? Expand! America could use a book like that, now more than ever. I know. I would love to. It's my oldest book idea. The backroads of America, the little gardens, big farms, the immigrant community farms, the markets, the wayside diners with tomatoes out back, finding what America is, now, by how it is, and isn't, eating. And Vince would just kill the landscapes. But...$$$$$! I know I can write from the road, but Vince can't do his current job from da road, and between us, he's the one with the real job. It would have to be heavily funded, somehow, and I just don't know how one can ethically Kickstart people into subsidizing a long camping trip. 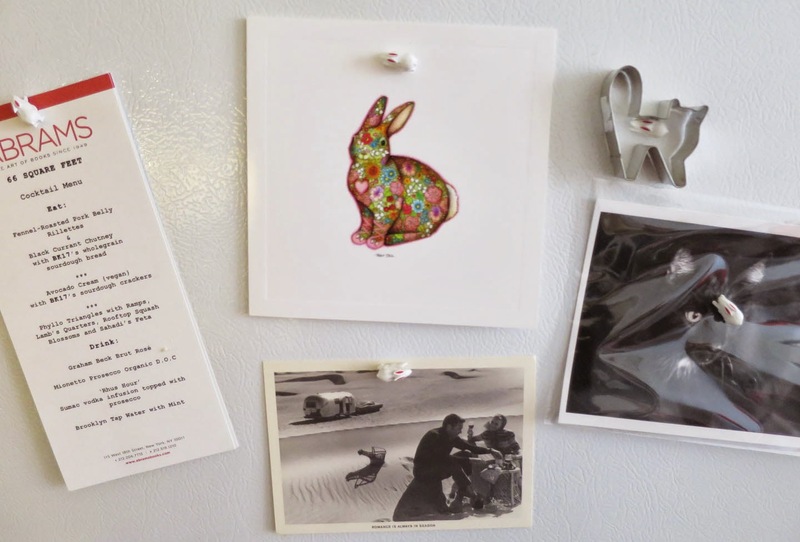 Bunnies and cats, that's what's on my fridge too. But less tidy. Sounds like a grea idea! It would take a lot of prep and organization. The follow up book could be titled 3,794,100 miles with Estorbo. I try to keep the fridge cleaned off, or at least rotated, but it's rarely empty. I have all my late mom's fridge magnets (mostly turtles and horned toads), and I usually keep some pics of the stepkids up, must to their chagrin (they are 19, now, and way cooler than anyone else has ever been in the history of cool, you know). top center is THE calendar - I look at it every day when I get up. the rest is mostly photos of kids - or pictures drawn by same kids, an occasional card or coupon - all held with magnets. Postcards from places I've visited on the front and a calendar on the far side facing the counter. I'm sure you could write a marvelous book and Vince's pictures would be marvelous. For some odd reason I never inherited the "camping gene" even through I live in part of the country in which camping, hiking, fishing, skiing and any type of outdoor activity is celebrated. It stayed there when the kids were little because I figured they couldn't read it. Once they were teens I would occasionally get the kid who would pause, read and grin. O well. Good for them to know their parents have a life. My younger brother who visits from time to time said he knew exactly what to get me for Christmas last year. Not a new frig, just a new frig door! On mine? Notes, half-finished poems, pictures of my children when they were little, telephone numbers, appointment times, recipes.....some things change frequently, some things have been there for years! The front of our fridge is stainless steel, but the enamelled sides have cheeky magnets. Be a forgheen good book. Weeth feesh! Four years later, the picture of the cats are gone (too sad) and a note from my mother reminding me to give water to the cats and the Christmas tree and pellets to the Christmas tree only took their place. Everything else remains the same.